Below the fold, here’s some stuff from the first five months of 2016. I also went back and fixed the pictures that weren’t displaying from the first two posts. This was a easy CC-listed target in Dry Creek Pioneer Regional Park on a cool day after some rain. The rock itself was a bit slippery when wet. The end of a California February. The flowers are blooming and the lizards are cuddling. 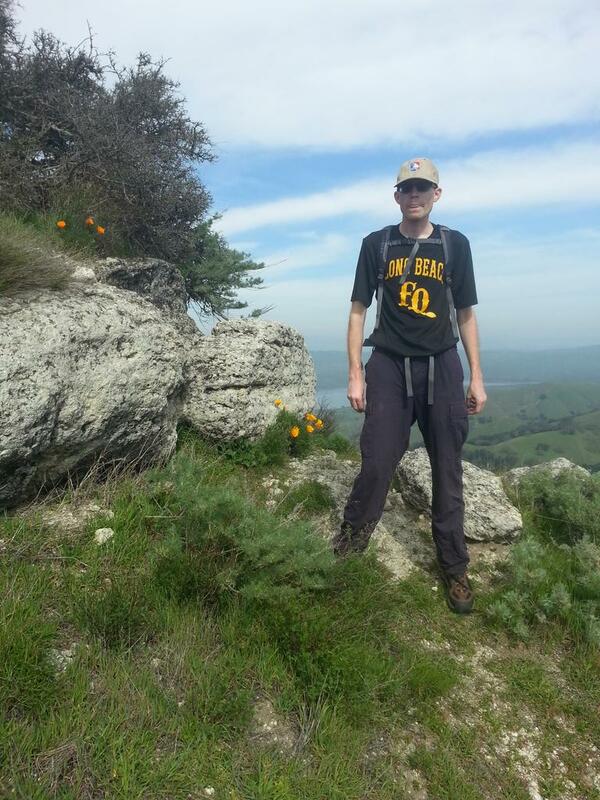 I needed to get out and hike a bit before the upcoming Western Regional Quidditch Championship. The Maguire Peaks are in the north of the Sunol Regional Wilderness and have great views of the southern East Bay; they made an appealing CC-listed target. I met another hiker on top and we spent a while talking and enjoying the view. Highly recommended if you’re looking for something to do in the Sunol Regional Wilderness that’s not Little Yosemite. It had been a couple months since my last county high point and I wanted more. I woke up this morning and somewhat impulsively drove to Virginia City, Nevada. I hadn’t been here since I was a kid, and my mind wasn’t on the historical and touristy attractions of the city proper. Instead, I parked at the first parking area in town and headed up the mountain And by “up the mountain”, I quite literally mean “up the mountain”. I didn’t immediately locate the Ophir Grade road and instead decided it would be navigationally simpler, plus more fun, to directly climb the rocks to the top of Mt. Davidson, passing near the “V” on its side. It was a bit chilly on top but the views and sounds of Virginia City were incredible. I went for the easier Ophir Grade route on the way down, which was faster but perhaps not quite as fun, then drove home through the snowy slopes of Donner Summit. Little Blue Ridge has a reputation for being a hellacious bushwack. However, much of the brush had been burned through by a fire the year before and hadn’t had a chance to grow back yet. I put on a long-sleeved shirt and pants, downloaded a couple recent GPS tracks, and headed out to Rieff Road to see for myself. Following in the steps of my predecessors, I found the navigation through the burned BLM area and Davis Creek to be relatively straightforward and indeed mostly devoid of live brush. There was still a lot of burned brush that gave my clothes and backpack a nice layer of charcoal, but despite being somewhat uncomfortable I was grateful to not be dealing with the unpleasantness that this must have been when all of the plants were alive. When I reached the old road, I was happy to finally reach clear sailing to the ridge. Unfortunately the route had one more trick left to play: a cow (with a calf) was blocking the trail a bit past Butte Rock. I ended up sidehilling through some more dead brush to avoid an unnecessary bovine encounter. I was greeted at the summit by a wave of loud flies. After struggling and failing to get the summit register box open, I decided to retreat and eat my lunch a bit father down the mountain, where there were fewer flies—and, for some reason, an abandoned sofa. 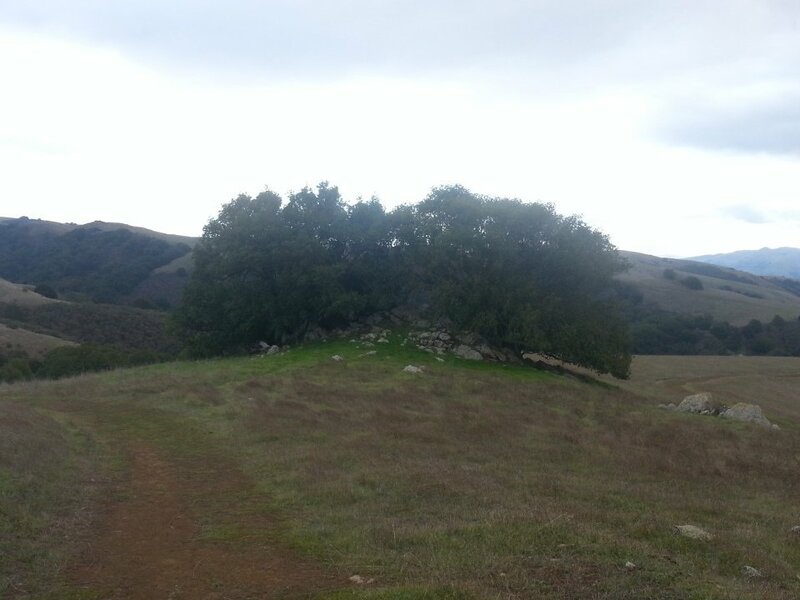 I tagged this feature on the way back from an Ohlone Wilderness Trail hike. It’s a nice little stop off the trail. Mt. Pinos is one of the easiest major peaks in California. I drove down to the Grapevine and took the exit signed for Mt. Pinos, then drove up to the parking lot at 8340′. From there it’s a short hike to the summit. I wanted to get the high point of Kern County on this trip as well. This gets a bit complicated because the Kern-Ventura county line crosses near the summit of Pinos and there is a rock outcropping on the Kern side of the line that is at roughly the same height as Sawmill Mountain, the “traditional” Kern County high point. I stepped on top of the rock outcropping and then started down the trail to Sawmill. Unfortunately, there was still a good amount of snow on this trail and at this point in the afternoon that meant a truly unpleasant amount of postholing. After a short while, I turned around and decided to come back for Sawmill at a later date after the snow had fully melted. I was in Columbia, South Carolina for the quidditch national championship and had a bit of time before going home. Unlike the mountains and hills of home, the highest point of Richland County is in the front of a subdivision. I stomped around for a bit although I didn’t really have much confidence that there was really any natural ground here at all, then headed back for my flight home. Historically, the west peak of Mt. Tamalpais was the highest summit on the mountain by a good thirty feet, but it was levelled during the Cold War to become an air defense station. Updated LIDAR data showed that it was, however, still four feet higher than the east peak, so it had to be visited. Fortunately, there is no obviously higher natural ground inside of the chain link fence containing the former military facility, so I simply circumnavigated the fence. It’s pretty ugly but still worthwhile to visit, although I’d definitely make sure to hit up the east peak too just for the views. Junipero Serra Peak is the highest peak in the Santa Lucia Range. To get to the trailhead, one has to first drive through Fort Hunter Liggett—old reports suggested that one is checked for ID at the entrance to the base but that was no longer the case when I went. While on the base, you have two paved vehicular stream crossings that are gated when there’s too much water for safety. 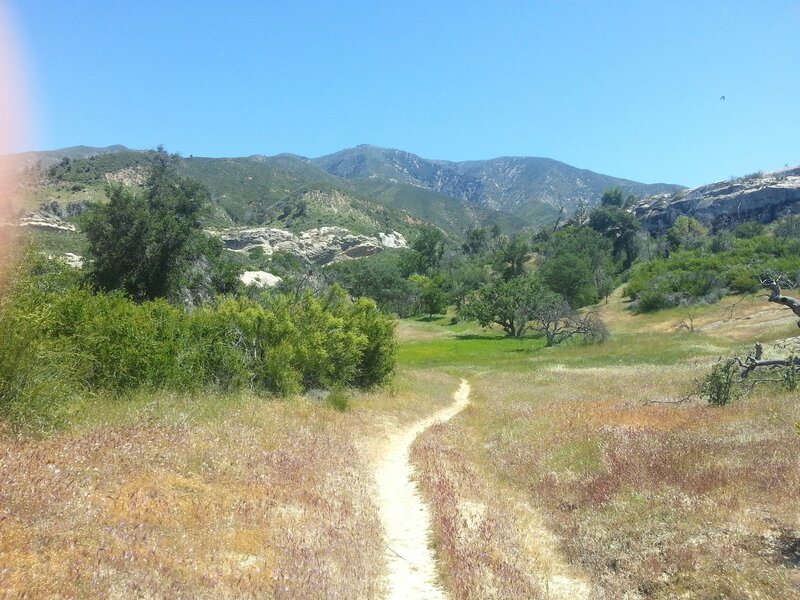 The trail was in reasonably good condition although there were points towards the top at which chaparral were encroaching. The main thing about this hike is that it’s pretty long and steep, with a solid 3772 feet of elevation gain. I’m glad I did it on a cool day. Surprisingly, you don’t have a great view of the Pacific from the top as an intervening ridge, topped by Cone Peak, gets in the way. There used to be a lookout tower here but it had fallen down and was in a fairly advanced state of decay. “Sugar Pine Peak” is a bit of a driving adventure. It took me a bit to find the correct junction for Scales Road, which is a gravel road, complete with a nice bridge over Slate Creek, off of the paved La Porte Road. Not encountering any vehicles since leaving pavement, I parked in the middle of the road where the gravel ended and quickly jaunted up to the high point. It’s in the middle of a forested area and there are absolutely no views, but the stump and stick structure that marks the high point looks cool. Anthony Peak and Black Butte are both located near Forest Highway 7, a high-speed gravel road in the Mendocino National Forest. I had hoped to do these in 2015, but upon reaching Covelo was turned back by a thunderstorm that clearly wasn’t going anywhere soon. Instead, I spent much of April and May refreshing the Mendocino National Forest website waiting to see when the road would once again be open after the winter. Today, it was. I started from U.S. Highway 101 and took the Highway 162 exit through Covelo, then turned right where Highway 162 turns into Alder Springs Road (Forest Highway 7), and then finally turned left onto M4. The first stop was Anthony Peak. I parked at the spur road to the peak and hiked up, which proved to be a good decision as snow fully covered part of the road that was hidden around a bend. The lookout tower was unmanned. After returning from Anthony Peak, I drove back to Forest Highway 7 and continued to the Black Butte spur road. I parked just off of FH7 as, between snow and fallen trees, the spur was clearly impassable to cars. On foot, I actually lost the main trail for a bit because of a large patch of snow; fortunately, there was a flagged use trail to the left that avoided most of the snow patches and then rejoined the main trail closer to the summit. I returned to my car without incident and continued east on Forest Highway 7 to where it resumes being Highway 162, then rode I-5 home from Willows.